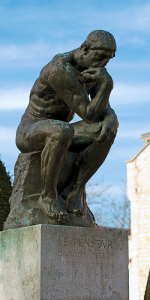 Rodin’s “The Thinker” could have been named “The Introvert”. Photo by James Whitesmith. Networking skills are not the exclusive property of extroverts. Introverts have them, too. Not the belle or beau of the ball? Don’t do well in groups? Are you kind of shy or just hate playing the networking game? You can still be a great networker. The best part is, you don’t have to and shouldn’t change you.